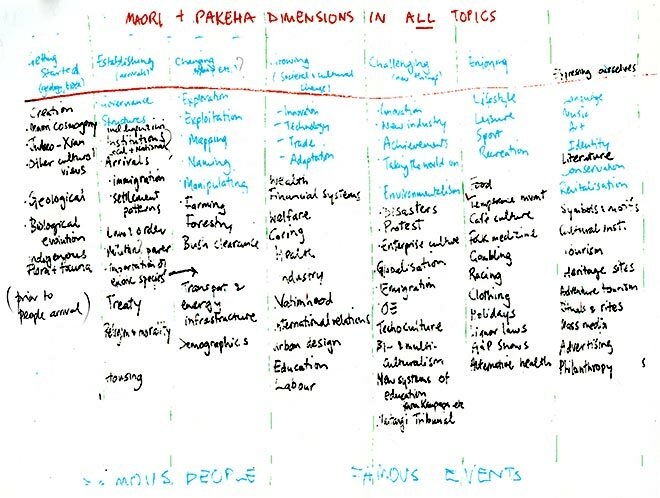 In these further notes from brainstorming sessions carried out in 2001–2 by Jock Phillips and Bronwyn Dalley, the shape of Te Ara begins to emerge. The structure listed as 'A' in the previous brainstorming notes is further broken down into specific entries under larger overall themes. In the note at the top, Phillips records the important decision to incorporate a Māori dimension throughout the encyclopedia, rather than confining Māori material to a single dedicated theme.